If things seemed bad at the end of the first season of Fate/Stay Night: Unlimited Blade Works, they seem exponentially worse by the end of the opening episode of this second season. 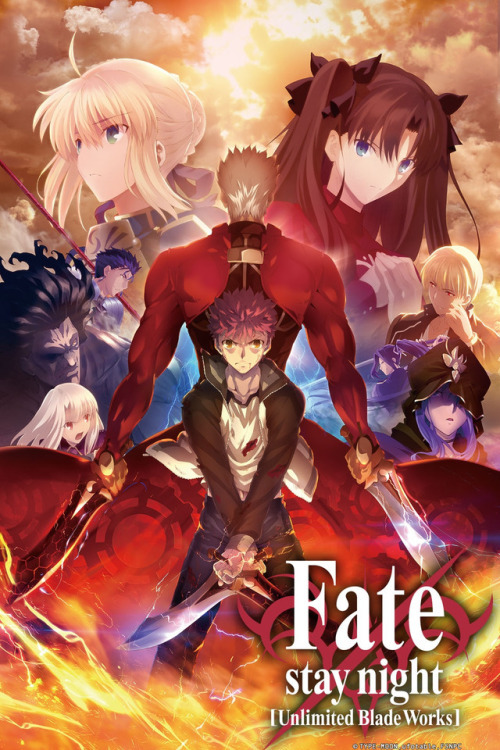 The last season ended with Shirou having his Command Seals and Servant snatched from him, effectively eliminating him as a Master, while Rin and Archer were looking to take Caster out before she could consolidate her hold on Saber. That confrontation plays out disastrously in this episode, but where some allegiances are broken, others are reinforced. This episode is largely about driving the plot forward and maintaining the momentum that the last season ended with but there are a handful of highly informative scenes that explore the motivations of our favourite anti-hero Archer as well as the evolving relationship between other characters. Despite our protagonists suffering an absolutely crushing defeat, the episode ends on an oddly tender note and it doesn’t feel like the situation is quite as thoroughly bleak as the audience might think. This week’s episode, ‘Time of Departure’ picks up a few hours after the last one ended yet it feels like Caster is in ascendancy. Residing in the very church that belonged to the Overseer isn’t just a bold move; it is a statement of intent. It would seem that Kotomine Kirei is dead but even discounting how nobody in-story believes that, it is difficult to think that a character like that would be so callously dismissed off-screen. There seem to be two things on Caster’s agenda at this point – locate the Holy Grail (though, it’s unclear which Grail she’s referring to, or even what the difference between them is) and to slowly erode Saber’s resistance to her influence. There is no doubt that Saber is being slowly forced into submission but the whole process has a slightly disturbing sexual nature to it. Between her attire, her position and Caster’s dominance over her, it’s hard not ignore that aspect of it. Assassin hinted at Caster’s feelings towards her Master previously and this episode pretty much eliminates any lingering questions. The exact nature of their relationship is unclear, however; during most of the previous season, it felt like Kuzuki was more than happy to let Caster do her thing but his unexpected appearance in this episode would imply that he has either changed his mind since then, or that he wasn’t quite as hands-off as we had been led to believe. Fascinating as Caster is, however, she is not nearly as interesting a character as Archer. It’s hard to pinpoint a single reason as to why Archer’s betrayal came as such a shock but there are certainly a few top contenders. Since his introduction, Archer’s loyalty to Rin seemed beyond doubt; yes, he’s done things behind her back and she’s had difficulty keeping him from attacking Shirou but it had always seemed that his actions stemmed from his desire to help Rin win the war. In hindsight however, it seems fairly obvious that he was unhappy with several of Rin’s decisions and that her insistence on certain issues, like the alliance with Shirou, chafed. 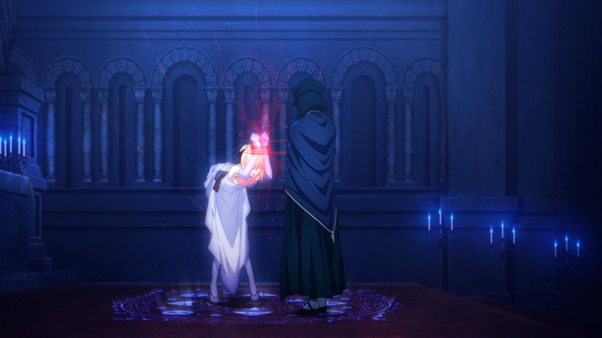 Furthermore, Archer’s sympathies towards Caster have been well-documented as well – time and time again, Archer has referred to Caster as a ‘proper’ mage and suggested allying with her, to the point that Rin was forced to exclude him from their first confrontation with Caster and Kuzuki. Despite all that, his betrayal is still surprising because it seemed like Rin and Archer had reached a new understanding in the early sections of this episode but it would seem that Archer’s mind was made when he realized that Rin was nowhere near as ruthless and pragmatic as he had once thought. 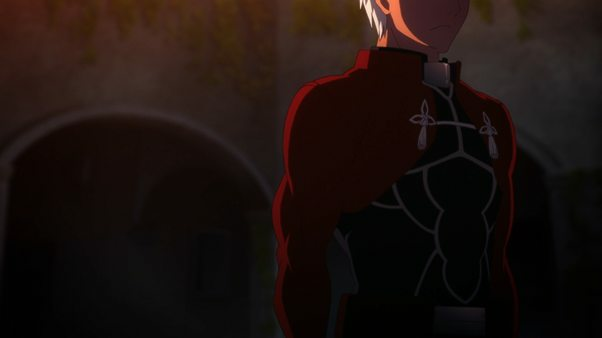 It would seem that Archer did not arrive at the church with the intention of throwing Rin under the bus but her intention to free Saber and return Shirou to his status as a Master made the decision for him. His exact reasons for switching sides aren’t clear just yet, but it’s highly unlikely that he did it solely because Caster was the ‘better’ Master. While grabbing Saber would certainly have improved Caster’s prospects in this war, Archer doesn’t seem like the sort of character who would switch sides because of something like that. Instead, it would seem that Archer had thought that now that Shirou was out of the picture, Rin would be able to focus on doing what needed to be done. This turned out not to be the case and the fact that she would go so far out of her way to help an ostensibly ‘enemy’ mage, especially one that Archer dislikes so very much, must have cemented in his mind the idea that Rin was just not in the right head space for the war any longer. Perhaps he realized that she had developed feelings for Shirou or perhaps it was something else entirely, but his decision seems particularly meaningful coming so soon after a discussion on regret. That conversation on regret, combined with the new information on Archer’s ‘mental landscape’, his past and his status as a Protector, all go an incredibly long way in explaining so very many of his conversations with Shirou. It turns out that both Rin and Caster are excellent judges of character because they were right; Shirou and Archer are incredibly similar. It would seem that Archer has Shirou’s dream job; as a Protector he is tasked with saving mankind. Yet, it would seem that watching mankind make mistake after mistake, over and over has jaded Archer to the point that he sees Shirou’s idealism and instantly detests it and by extension, Shirou himself. It also explains why Archer is able to understand Shirou’s point of view so perfectly; he has lived that ‘hero of justice’ life and it’s not too much of a stretch to think that at some point, he too believed in its value and importance. I wonder if Archer’s dislike toward Shirou is him seeing a younger, more naïve version of himself and hating it because it resonates so powerfully with his own experiences. It’s a little like growing up and seeing a middle-school version of yourself and wanting to tell them to wake up to the realities of life. It’s an understandable response but not one that really explains the level of loathing that Archer displays towards Shirou. The conversation on regret is interesting in this context because he states that his ‘end’ has long since passed and it seems like Archer is saying that what he believes no longer matters but it seems like he evaded the question more than he answered it. Does he regret dedicating his life/afterlife to being a Protector? His request to let Rin leave was somewhat understandable – despite what he says, he has his own soft spots, but letting Shirou leave was honestly baffling. He hates Shirou, so why would he not take this opportunity to kill him? Perhaps he wanted to save Rin the additional anguish? It seems like a little too much compassion from someone like Archer but it’s clear that despite his betrayal, he doesn’t have anything against Rin personally. Archer’s decisions will have enormous repercussions on both the plot and the rest of the characters, of course, and no one is more affected than Rin. 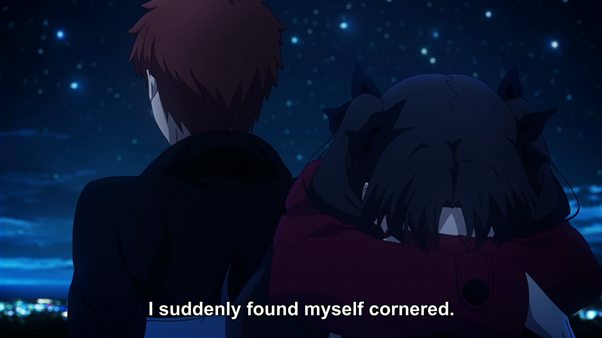 In the beginning, it seems that Rin isn’t as affected by Shirou’s defeat but one interpretation of her conversation about regrets is that she feels responsible for Caster beating Shirou since it was Rin who decided to leave Caster alone for as long as she did. 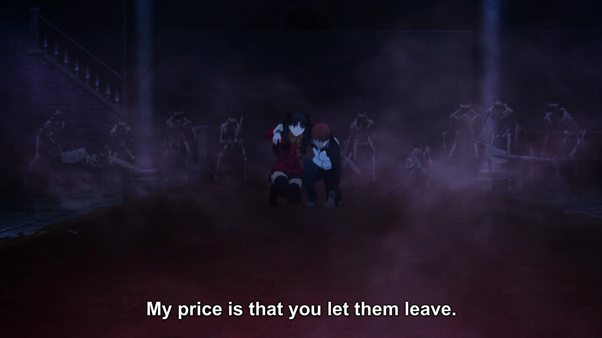 I can’t quite remember Rin making an active decision to leave Caster alone and while their confrontation did occur fairly late in the first season, it feels like Caster has been their primary antagonist for a long while. Either way, it seemed Rin’s assault on Caster’s base of operations was just a strategic move but also a way for her to make amends for what she considered her mistake. Archer’s betrayal leaves her distraught but unable to properly express it, which is very much in line with her character. There is anger at Archer of course, and hurt too, but they would seem to be outweighed by her disappointment at herself. She is certainly being harsh on herself; if not for Archer’s betrayal, her plan seemed like it had a good chance of working, despite the various trump cards that Caster held. Nevertheless, it seems like she feels responsible not just for her defeat but for Shirou’s as well. It’s logical; after all, almost everything Shirou has done so far in the war has been at Rin’s instruction but it’s clear that Shirou doesn’t blame her for the way things panned out. Speaking of Shirou, it is surprising, in a pleasant and refreshing way, to see him be so open about his feelings for Rin. Their relationship has definitely evolved over the course of the first season and even if Rin doesn’t say it outright, it’s abundantly clear that she feels the same way. Shirou being able to step up and really spit it out is especially welcome given how cagey he is about his more negative emotions. He understands how terrible Rin must feel and offers just the right kind of positive reinforcement and emotional support. It makes the whole scene really touching in its simplicity; take away the Grail War, the constant danger and the rest of it, and that scene just comes down to two people, children really, no matter how you look at it, supporting each other. The scene is complicated a little by the mysterious pendant which seems to exist just in order to bug me. 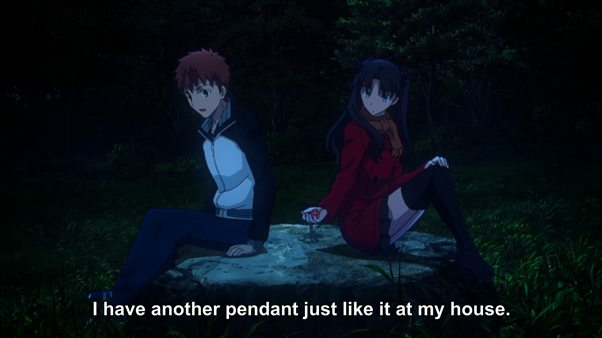 It’s clear that two pendants exist at this point – the pendant that Shirou picked up at the scene and the one Archer returned to Rin. It seems that that brought an epiphany to Rin, but what exactly she figured out is unclear. It’s good to know however, that the pendant thing wasn’t just an oversight. So, where does all of this leave us? With twelve episodes to go, the show can literally go in any direction at this point. Our protagonists have no Servants at their disposal and without them their combat capabilities are questionable at best. The enemy, which would seem to be Team Caster for the foreseeable future, has a whopping four Servants; Saber (sort of), Archer, Assassin and Caster herself. The only way out that I can see is a new alliance; Berserker, Lancer and the new Rider (or whatever the blond Servant actually is) would need to work together to beat the combined might of Caster and her cronies. As much as I would hate to see Shinji redeemed in any way, the potential for epic fights between those teams is just too mouth-watering to pass up. As a final note, shout out to highfirex for sending me a Crunchyroll guest pass! I used it for the screenshots this episode! While the subs refer to Archer as a ‘Protector,’ that is not what the official translation is meant to be. Canonically, Archer is what’s called a Counter Guardian. that frustrated me so much. and it seems like such an unnecessary change, too. I have to say, your insight is quite a refreshing read compared to the usual commentary and reviews. I hope you continue to write excellent reviews in the future. Not much to add here. I think you nailed it all. Great review. I’m back, life happened for a while. Anyway, was that an interesting start or what? anyway, as always, your review is spot-on, for the most part. And I admit, I’m quite hyped to see the rest of the season, now.